I have that song stuck in my head by Blondie. Anyone remember that, or am I just dating myself again? hehe. It’s all downhill to the weekend from here! Thanks for stopping by. Peace, love, and friendly waves (of all kinds) to you! This is wonderful! The little spark of red is perfect. I just saw Blondie’s “Greatest Hits” at a library sale, but alas, the CD was scratched beyond hope, so I didn’t buy it. But it certainly made me remember all those great songs. Yup, I’ve got the earworm now… liking the water you’ve got there, looks like it’s inspired by oil painting. Happy Hump Day! The touch of red is perfect!! Fun to have such a great way to unwind. Keep singing and drawing and painting!! I just saw your lovely painting! Brilliant job on it, Jodi! I can’t believe you’re a beginner! You are too kind. VERY much a beginner! This is really cool! 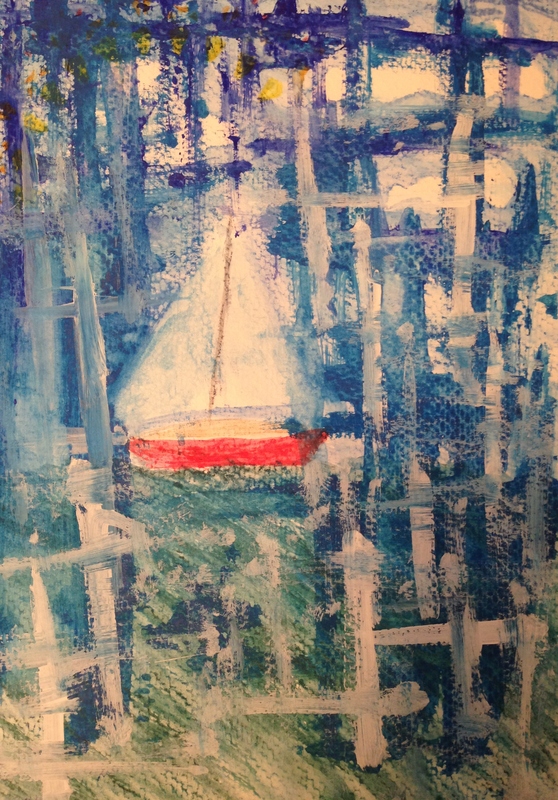 I like how the red boat contrasts with the blue waters, and I like the general style of this piece–I think it’s the way you used different mediums and the ways the colors mix and stand out in streaks. Thanks! My brain was streaking when I did this, I think. lol. That’s a fun Blondie song…one of their later hits, but defintely one of the three I always think of when I think of Blondie (after Heart of Glass and Call Me). 🙂 Hope you’re now in a better frame of mind! Oh, no…are you very allergic to those things? I sometimes wish I didn’t like gluten and sweet things (or fried and salty things) so much. Not allergic, just intolerant. Gluten and corn are my worst ones. They made me sick for years, and I had no clue til a functional medical doctor asked me what I eat. She changed my life in that moment! Thank God for good doctors. Yeah, so corn is in pretty much anything in a box or package in the supermarket. It’s called about 300 different things. I have to make my food from scratch, from ingredients as close to raw as possible, to avoid it. My food issues are what drove me to art, lol. So I guess it’s all good. I’m with you – love the sweets and the salties. Great composition, great texture, great color. Wow! thanks, C! I almost didn’t post this. Glad you enjoyed! Almost didn’t post? Really??!! Well, I think we have to paint and draw and sketch to please ourselves in many ways – but I’ve learned from you and others not to be overly critical of one’s own work. Thanks for that lesson! This painting is a keeper Laura, mat it and frame it! Beautifully done! Holy hell, thanks Sharon! I almost didn’t post this, I had no clue so many would like it! Wow, not sure what to say, except thanks again for your encouragement! It’s in a spiral-bound art journal, or I’d gladly send it off to you, Sharon! It’s still not my favorite, but thanks to all the wonderful comments, I do appreciate it more than I did initially. 😀 Thanks very much for your kind encouragement. What a delightful sweet and dreamy image, I can look at that all day! Wow, thank you! I really appreciate that! WOW…That is so beautiful! Very well done! I like this very much. I’ve been wondering how to do more abstract images. You have accomplished something here: there’s a sort of peace amid chaos feeling. I love the way that light seems to work. Well done. Kirk, I’d love to see you do abstract stuff! You never know; you may really love it! I hope you try it. I’d like to as well. I just can’t wrap my head around how to even begin anything abstract. hmm… Maybe start with a favorite color(s) and a mood or feeling you wanna create? Or maybe you’d like to explore how a few colors might mix? It was weird for me too, at first, but as it turns out, I like it. I think it’s easier to communicate (for me) in abstract. Less thinking, more feeling and doing. It feels more like art class when I was a little kid. Fun! I think you just gave me permission to just have fun. I like your starting points. On my Tumblr I track a few German abstract painters I like. I am deeply attracted to some of what I’ve seen. Thanks! Woot! Awesome! Oh, please have fun, or else what’s the point. Goal-oriented is great, but everyone loved art class in elementary school because it was pure fun. I think we need to recapture that. Looking forward to Kirkistan Abstractions! I’m loving this mysterious little painting! I’m wanting to know what’s going on in the sailboat AND in the water. Thank you. LOL I’m so glad, Jo! Your work ALWAYS intrigues the heck outta me; I’m happy to be returning the favor. The boat hasss secretssss, precioussssss lol! What record would you add to this (if any)? Any record/song or an altered one from the blog? Thank you, Mary! This was totally mood-driven. It was one of those days. Needed to play! Wow! Thanks, Jill! Do you think a print of this would sell? So true! Do you ever do paintings like this, Ann? Cool, Ann! I’d love to see it!